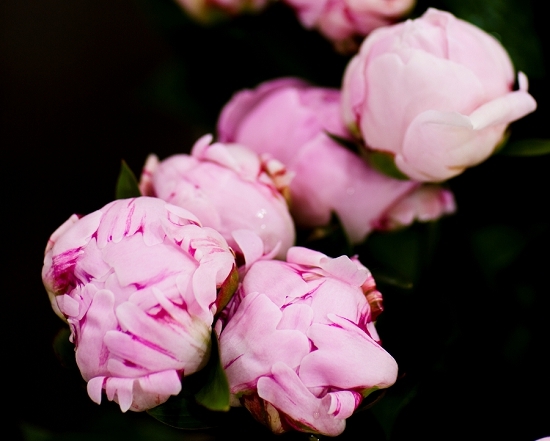 On Day Five of British Flowers Week: Discover all about Scarlet & Violet's favourite British summer flower, the peony! 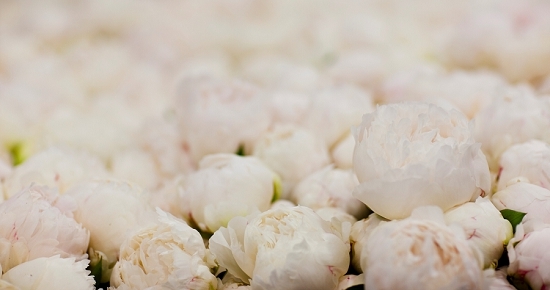 Reams of text have been penned about the peony, which has been cultivated in China for over 4000 years. The peony derived its name from Paeon. A student of Asclepius, the Greek god of healing, Paeon was turned into a peony flower by Zeus to save him from the jealous anger of his mentor. The peony was highly regarded for the medicinal properties of its roots and seeds, which were used variously as treatments for bladder stones, jaundice, stomach problems, labour pains, nightmares, epilepsy, and 'lunacy'. Quite the list! To the Chinese, the peony symbolizes wealth, luck, elegance and poise; to the Greeks healing; to the Japanese happy marriage and virility; and to the demure Victorians shame and bashfulness. Of the three types of peonies (tree, herbaceous and intersectional peonies), the most widely grown as a British cut flower is the herbaceous peony, raised from the wild Chinese peony Paeonia lactiflora. 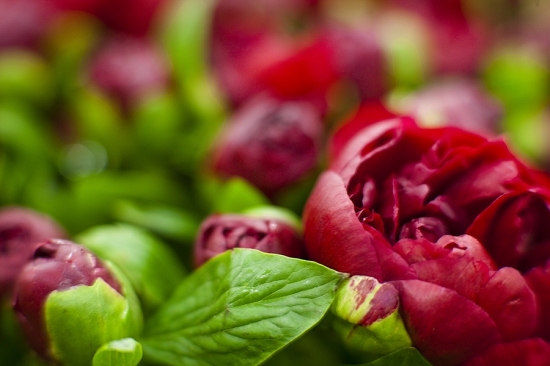 Today the peony is adored by florists for its large, romantic, blousy blooms and its delicious fragrances. The colour palette ranges from deepest red to blush pink and the purest white, from corals and apricot shades to warm, creamy yellow. The arrival at New Covent Garden Flower Market of the first British-grown cut peonies is a cause for celebration! "English peonies are just the best," says Vic Brotherson who chose the British peony as her favourite summer flower for British Flowers Week. "They start the season as quite soft, small headed blooms, and within a fortnight match anything grown abroad for size – and they last much longer and the quality is better." Amongst the most famous varieties grown in the UK are the pure pink 'Sarah Bernhardt', the warm pink 'Alexander Fleming', the fresh white 'Festiva Maxima' and the apricot-pink 'Coral Charm'. Peonies can be tricky. 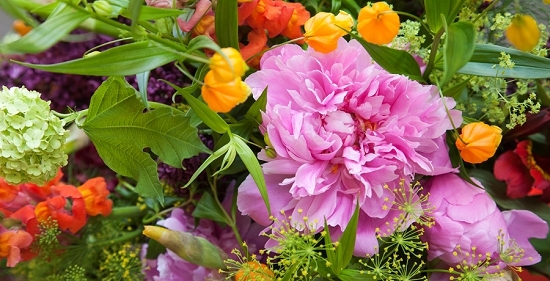 The best advice pooled from Flower Market florists is to buy British peonies as the buds are showing colour, then hide them away for up to 10 days before the event in a cool room (less time if it's warm), by which time the will come into perfect bloom. They can then last for weeks. 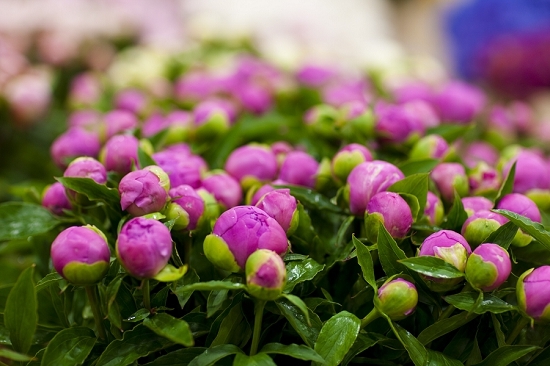 The peak season for British-grown peonies is from mid-May to early July. During this period, they generally come into the Flower Market fresh from the growers for Monday and Thursday morning trading.